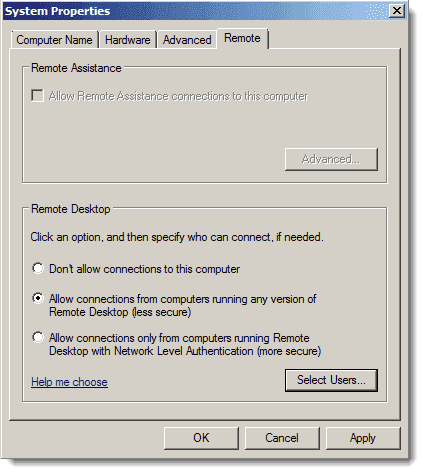 This blog post will share reliable methods for establishing both remote desktop and remote command-prompt sessions to a target a Windows computers. Here is the scenario: you are the systems administrator of a mixed Windows/Mac OS X network environment. Your administrative laptop runs Mac OS X 10.7 Lion, and you realize that you need to establish a remote connection to one of your Windows Server 2008 computers to tweak a setting. What do you do? Please see the Microsoft documentation if you want more background on Network Level Authentication. In this exercise I downloaded and installed FreeSSHd. 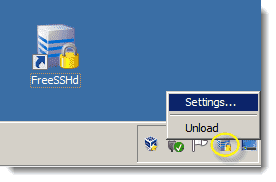 One point of confusion: after installation you might want to double-click the FreeSSHd desktop icon to open the administration panel. This does NOTHING. Instead, right-click the FreeSSHd system tray icon and select Settings… from the shortcut menu. This is shown in the following screenshot. After you’ve installed FreeSSHd and ensured that the service is running in the Windows Service Control Manager, our next (and final) configuration task is to create an SSH user. The User properties dialog box is shown in the next figure. In this example, we are enabling the 4Sysopslab domain administrator account to connect to the server by using SSH. Note that FreeSSHd includes secure FTP and Tunneling options as well.